I worry about cats. I have 5 of them —- oh wait, let me rephrase that – my neighbour has 5 cats!! Bwahaha! 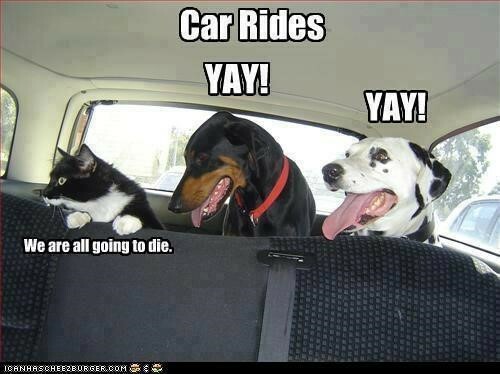 I cannot even fathom taking a cat on a car ride. With or without dogs! I used to cat sit for a friend many years ago. Sadly the cat passed on and she never got another one. I was sent my list of instructions because it’s a house cat, I hope it likes me and doesn’t scratch, I’ve never even picked a cat up. Suggestion: Try not to wear black. Cat hairs will show up on black and if it’s friendly it will want to jump up and sit on your lap leaving cat hairs on your black clothes. What fun….